This glorious warm leafy salad with crispy garlic croutons makes a lovely relaxed weekend lunch. It's simple to make and ready in just half an hour. For the best flavour, use Waitrose Lightmeat Tuna in Olive Oil; they are large meaty pieces of full-flavoured fish and are exclusive to Waitrose. Preheat the oven to 180°C, gas mark 4. Place the 3 garlic and cheese slices on a baking tray and bake for 6-8 minutes until golden. Allow to cool. Meanwhile, drain the tuna fillets, reserving the oil. Place the tuna and red onion in a large salad bowl and arrange the salad leaves on top. Tear the garlic and cheese slices roughly into croutons and scatter over the salad leaves. Place the reserved tuna oil in a small jug or jar and add the dressing. Whisk or shake well to mix the salad dressing. Bring a small pan of water to the boil. Break the eggs into a cup, one at a time, and carefully pour them into the boiling water. Remove the pan from the heat and leave the eggs to continue to poach in the hot water for 5 minutes. Drain and reserve. Pour the salad dressing over the salad and toss everything together lightly. 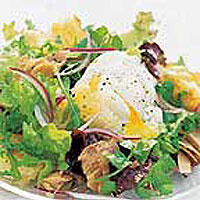 Divide between two serving plates and top each one with a warm poached egg. Season with freshly ground black pepper and serve immediately. Note: This recipe contains lightly cooked eggs and is not suitable for young children, pregnant women elderly people or those whose immune systems are weak. For a lower-fat option, use Amalfi Fillets of Tuna in Spring Water and Waitrose Perfectly Balanced Oil Free Lime & Coriander Fresh Dressing. The remaining ½ pack of bread slices can be frozen for up to 1 month.